Ru la la 2.0 Sterling silver and 14K gold filled wire wrapped bracelet. Indonesian petrified opalwood earrings. "dreaming of summer"
Announcement All payments are now made through Etsy payments using Etsy's approved methods. All payments are now made through Etsy payments using Etsy's approved methods. Bumblebee jasper and onyx earrings. Sterling silver. handcrafted. Peanut obsidian and sterling silver pendant. 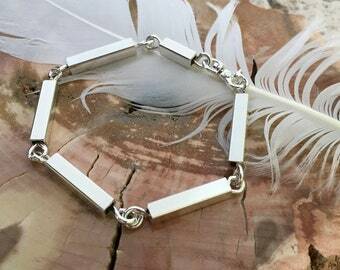 Sterling silver Chainmaille plus S links solid Sterling heavy clasp. 1.75 oz. Sailors Knot Cuff bracelet - wire wrapped in Sterling Silver and 14K gold filled. Sterling silver and carnelian earrings. 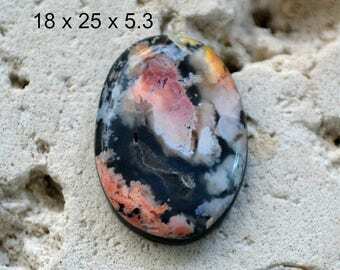 Linda Marie Plume agate cabochon. designer cut collector cabochon. 22.5 x 40. Desert bloom variscite pendant. Sterling and fine silver. Spring has Sprung. Sterling silver horse earrings. Wire horseheads handmade. 'Equus'. Sterling silver interchangeable bracelet focal stones 13-18. "Switcheroo". Boulder opal ring. handmade sterling silver with good luck frog. Keith Cler cut opal. Moroccan coral stone pendant in sterling silver and solid 14K gold accents. Sterling silver fringe earrings. Silver dangle earrings. hand forged. Rosetta stone tooth pendant. Capped in Sterling silver. 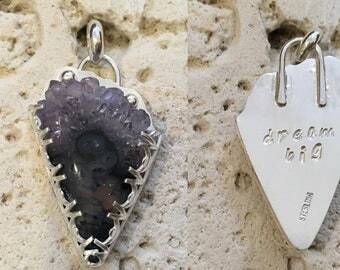 "zig zag"
Amethyst stalactite crystal pendant. hand stamped Dream Big on the back. Exclamation point earrings. 14K goldfill earrings shown or choose sterling silver. Time for spring and butterflies. Hello - my name is Terri and "I'm addicted to rocks"
uh oh, my studio helper laying down on the job. It is an honor to sell a piece of jewelry which I designed and made with my 2 hands from start to finish. I am addicted to rocks and in love with my torch. My workbench and studio is my favorite place to be and I hope the joy I get there shows in the jewelry I make. I begin making my jewelry from the ground up. I hand select slabs of rocks from all over the world, which I cut, shape and polish into cabochons. Some are included in my own jewelry and some I sell to other talented jewelry makers. I am proud to be a one-woman shop and that I hand fabricate all my designs myself and follow FTC guidelines for handmade. I occaisonally teach wire wrapping at the local Bead Store here (IslandBeadCompany.com ) and am grateful to them for the opportunity. I have met so many wonderful students and together we've created many 'happy accidents'. I use only Sterling Silver and 14K gold filled and the occasional copper for my jewelry. I'm also getting brave enough to add a lilttle 14K solid gold to my pieces. I want my pieces to last you a lifetime. Satisfaction guaranteed. Welcome to www.UntwistedSister.com. I'm so glad you've stopped by. My goal is to offer the finest quality materials and workmanship at reasonable prices with great customer service. I welcome any and all of your comments and questions. Thanks for stopping by and I hope you'll like what you see here. UntwistedSister only has access to limited personal data for basic business purposes. When you place an order with me, I receive your name, delivery address and email address from Etsy. I only use these details to process and deliver your order which may include providing third party insurance, or answer any questions you have related to that order. If you send me a message using the contact button on Etsy, I will receive your username and convo address. • With delivery and insurance provider companies to fulfill your order. I will only retain your details for as long as necessary in order to process the transaction and I will securely store any data collected during that period. I retain personal data related to orders or customer queries for three years. After this time I will delete your data from my records. You have the right to know what personal data I hold about you, and to ask for that data to be changed or deleted. You may contact me via Etsy convo or any of the contact buttons in my Etsy shop.